My second grader is a great reader, but her spelling isn’t yet where it needs to be. So when asked to review Traditional Spelling I from Memoria Press, I jumped at the chance! The Teacher’s Manual includes a sample lesson plan, for a four-day a week schedule (with the final test being on day 5). Then, each lesson of the student book is included in the manual, with answers written where they should go, and extra teaching material around the sides. It was nice not having to try to come up with an example on the fly. The Teacher’s Manual is definitely an integral part of this curriculum. It ties everything together, and makes the teaching part easy. It also contains the instructions for the dictation component. This spiral bound book is the key part of the program for the students. Each weekly lesson is broken into four pages of material. It was a good amount on each page, not too much, but enough for students to really practice working with the words. The four day lessons always follow a pattern. Day One introduces students to the new word list. It shares a phonics tip. Then, students sort the words and write them. For instance, they might write words where long a is spelled a_e in one section of the worksheet, and words where long a is spelled ay on another. Day Two has a focused word study. Students might sort and write the words based on vowel patterns or rhyming words. Some weeks has a word unscramble puzzle. Then, the second part of Day 2 is called Colorful Letters. Here, students write each word and then use colored pencils to color code vowel patterns, and mark macrons and breves to show long and short vowel sounds. Day Four is all about dictation. Students write the sounds, words, or sentences the teacher says. This book has each week’s spelling list on a page, with room for students to write each word two times. It’s a quick way for them to get some extra practice if needed. This little spiral bound book is full of wisdom for teaching phonics to children. At the end, there’s an entire section of suggestions for teachers. 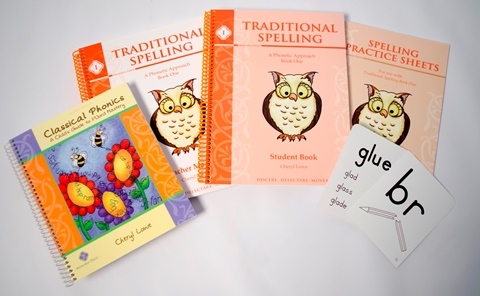 This offers suggestions on how to use the book, phonics and spelling rules, and more. There’s a ton of information that parents can use to help give their children a solid foundation of spelling. These cards are printed on cardstock to make them more durable. On some are the letters of the alphabet. Others have phonemes and examples of words with that letter pair. Many have sight words. The Teacher’s Guide indicates which cards are used during each week, and offers suggestions on how to use them. I had my second grader complete a lesson each day. It took about ten or fifteen minutes each day. Day two was typically the longest lesson each week. She and her siblings often played games with the flashcards as well. They enjoyed hiding them for the others to find and read, making roads for their cars to drive on as they read them, and tossing a ball of aluminum foil onto the card someone called out. I did not give my child the recommended spelling tests at the end of each week. Since we only homeschool four days a week, I didn’t want to have her do a test on Fridays. What Did We Think of Traditional Spelling I? As a former teacher with a master’s in reading and literacy, I appreciated the phonetic foundation this curriculum provides. It teaches students to look for spelling patterns, instead of merely asking them to memorize a bunch of rules. The amount of work was appropriate, and I appreciated the ease of teaching. And, I have to say…my daughter’s spelling is definitely improving. When she writes her stories now, she’s more careful to include each sound of every word instead of just the most emphasized ones. That’s a good thing, and makes her writing much simpler for me to read! My daughter’s favorite part was Day Three. She always enjoyed reading the passages and sharing what she learned with everyone else. She also liked playing with the flashcards. Her least favorite activity was the dictation. It’s not something we’ve done a lot of before, so it was a new experience for her. All in all, I think this is a solid program, and it is working for my daughter! I’d recommend this for children in grades 1-3. Memoria Press also has a Traditional Spelling II, designed to follow after this one. I think I’ll have to look into it for next year! To learn more about these and other products from Memoria Press (like their Music Appreciation I), click on the banner below.